In an era when car companies are developing autonomous vehicles that drive themselves, Mazda is doubling down on human driving enjoyment. At the same time, the automaker is trying to reposition its brand as premium, aiming to play in a space that emphasizes style and substance over size or status. 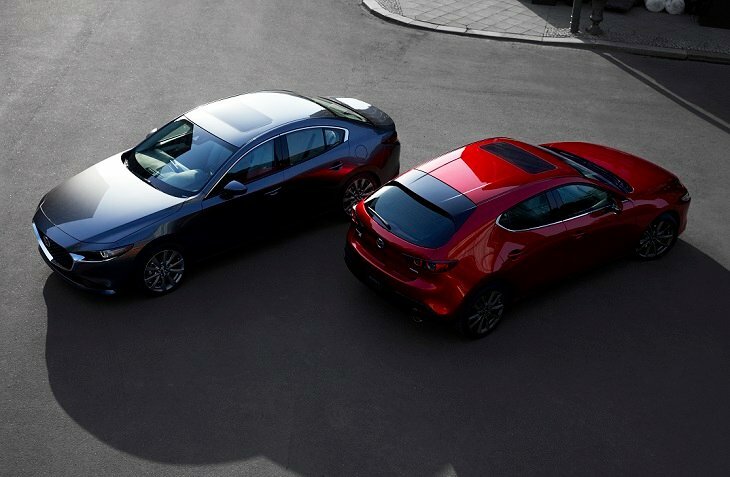 Redesigned for 2019, the new Mazda 3 hatchback and sedan are the latest of the company’s models to reflect this move upscale. Built on a new vehicle architecture, equipped with a new engine technology, and available with all-wheel drive (AWD), the 2019 Mazda 3 will certainly appeal to people seeking something different from the usual suspects in the compact car segment. Daring and dramatic, the 2019 Mazda 3 hatchback requires some acclimation. A long hood and front overhang, tapered greenhouse, stubby tail, and lack of clearly defined character lines give the car an imbalanced appearance when viewed from the front corner. Sedans are more conventionally shaped, but don’t take that to mean that they’re boring to behold. The 2019 Mazda 3 sedan is a handsome car with a clean, sophisticated, and upscale appearance. As might be expected of a car designed to satisfy its driver, the new Mazda 3’s interior is focused on the person sitting behind the steering wheel. From front-seat designs that include standard cushion tilt adjustment to maximize thigh support to windshield pillars carefully shaped to maximize outward visibility, Mazda tries to eliminate distractions such as discomfort or a blocked view. Along the same lines, instrumentation and controls are as simplified as is possible. Mazda even goes so far as to render everything in unified fonts to bring order to the cabin. Black and Greige (gray and beige) cloth upholstery is standard, with black, white, and burgundy leather available. Mazda has announced several gasoline (Skyactiv-G) and diesel (Skyactiv-D) engines for the new Mazda 3, including 2.0-liter and 2.5-liter Skyactiv-G 4-cylinder power plants and a long-rumored 1.8-liter Skyactiv-D 4-cylinder. A 6-speed manual gearbox and a 6-speed automatic transmission are available. The big news, however, is a new Skyactiv-X engine with M Hybrid technology. Mazda released no horsepower or torque figures for this drivetrain (or any of them), but the company has previously stated that it would provide a 30% improvement in power and a 20% improvement in fuel economy compared with an equivalent Skyactiv-G engine. All-wheel drive is a new option for 2019. That makes the new Mazda 3 instantly attractive to cold-weather dwellers. Standard equipment includes G-Vectoring Control Plus (GVC Plus) technology, which adds new yaw moment control to Mazda’s brake-based driving dynamics enhancement system. This new Mazda 3 rides on standard 16-in. or available 18-in. aluminum wheels. However, it swaps a sophisticated multi-link rear suspension for a less expensive and more rudimentary torsion beam design. Given Mazda’s focus on improved ride and handling characteristics, this seems an odd choice. The outgoing Mazda 3 employed 3% ultra-high-strength steel in its vehicle architecture. With this redesign, 30% of the new 2019 Mazda 3’s Skyactiv Vehicle Architecture is comprised of that material. Why does this matter? A stiffer vehicle architecture contributes to improved driving dynamics, and it is critical to absorbing and dispersing crash energy should a collision take place. Mazda’s i-Activsense suite of driver-assistance and collision-avoidance technologies is available for the 2019 Mazda 3, now enhanced with a driver monitoring system, front cross-traffic alert system, and an adaptive cruise control system with lane-centering assist that the company calls a Cruising & Traffic Support system. Next-generation Mazda Connect infotainment technology is standard for the new Mazda 3. Using center console controls (and likely voice commands and steering wheel controls), the driver or front passenger navigates main menu selections visible on a new 8.8-in. display screen. The system includes a digital owner’s manual that intends to provide quick answers to questions about the vehicle. Apple CarPlay and Android Auto are standard, complementing Bluetooth music streaming and SiriusXM satellite radio. Mazda says the standard 8-speaker audio system includes carefully placed speakers to maximize the driver’s enjoyment, and that a 12-speaker Bose premium sound system is an option.